Herbicidal Maniac is a 2-vs-2 minigame in Mario Party 7. The minigame's name is a portmanteau on "homicidal maniac", which is a term that refers to a person with an insane desire to kill other people, and "herbicide", a chemical used to kill plants. Piranha Plants and bombs emerge from all of the pipes, and then go back in as the players' pipe platforms move up. Two people on each team have to shoot all of the Piranha Plants that pop out of the holes three times. 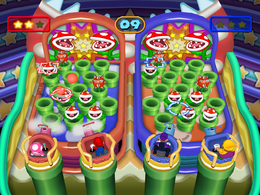 However, if a bomb is hit, many more Piranha Plants will appear, making it more difficult for the player to win. The easy way to identify the player's target cursor is that the first player has a round one and the second player has a square one. The winning team does their winning animations, while the losing players do their losing animations as their platforms are lowered. If the minigame ends in a tie, both teams' platforms are lowered. Rules – "Fire at the Piranha Plants when they emerge from the pipe. The first team to 3 points is the winner." Advice – "Whatever you do, don't hit the bombs! The resulting explosion will cause a Piranha Plant infestation!" This page was last edited on August 5, 2017, at 12:55.